PlaySmart are often asked for our thoughts on using grass mats as playground fall protection for taller items of kit. 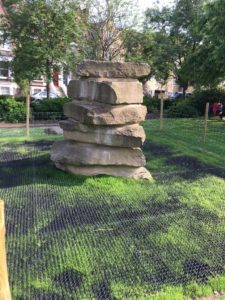 While field tests often see grass mats achieving very impressive results for critical fall height, we have always preferred to consider the absolute worst case ground scenarios for safety. For this reason, we only recommend the use of grass mats on their own up to a required fall height of 2 metres. Inevitably ground conditions can vary from location to location – once you couple that with inevitable changes in the soil due to weather and potential challenges in maintenance for an area, the ground could be better compared with concrete than fluffy fresh turf. 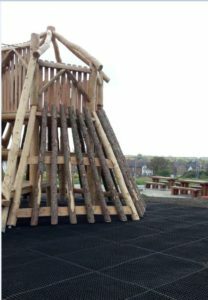 What safety surfacing is suitable for playground fall protection? For that reason, PlaySmart recommend the use of the SmartPlay system on items of kit with a fall height requirement above 2 meters. This not only gives more surety in fall height but also reduces variations in ground type and maintenance going forward. If you’d like to discuss grass matting further, please feel free to get in touch! You can reach our experienced team directly on 01564 742 811.